Stew Crews and Green Infrastructure too! Palermo’s “Stew Crew” helped out the valley by picking up a “pizz-a” trash or two! Founded in 1999, Menomonee Valley Partners (MVP) has done a lot for Milwaukee’s Menomonee River Valley in the past nearly 20 years. Since its inception, the partnership has envisioned a future for the valley that integrates economical, ecological, and social equity into a revitalized urban district. Clearly, this vision has started to become the reality for the Valley since MVP’s founding as 51 companies and over 5,200 jobs have moved into the Valley and 300 acres of brownfields have been developed with over one million square feet of green buildings. This all started with one of MVP’s first partnerships back in 2000, when they began work with the City of Milwaukee, 16th Street Community Health Center, and other partners on a Master Plan for a nuisance property. The site of a crumbling, abandoned factory, previous ideas for the property had included a prison and a park. However, residents of neighborhoods surrounding the Valley favored a development that would have access to the river as well as the added bonus of bringing jobs into the district. To meet both needs, MVP and its partners developed a plan that would encourage manufacturing companies to move to the Valley while still allowing residents to access the river, which had previously been inaccessible. With the plans completed by 2002, work began on creating a site that reserved approximately half the land for industry and half for parks, including a “stormwater park.” However, these two halves were not created to be separate entities, but as two halves of a system that would encourage a healthy environment and citizen involvement. The stormwater park was designed to hold enough water to prevent any stormwater from up to a 100 year rain event from entering the combined sewer system. Falling on the impervious surfaces of the industrial areas and roads, the water would runoff into the basins of the park, which would then be funneled into wetland-like areas that acted as filters that cleaned the water before it entered the river. More than just a stormwater conveyance system, this park contains many trails and other options for recreation throughout. Employees of the newly settled businesses take walks and utilize soccer fields located in the park. As a result of this connection to the land, employees started creating “Stew Crews”, or stewardship crews, that take ownership of the park’s health. 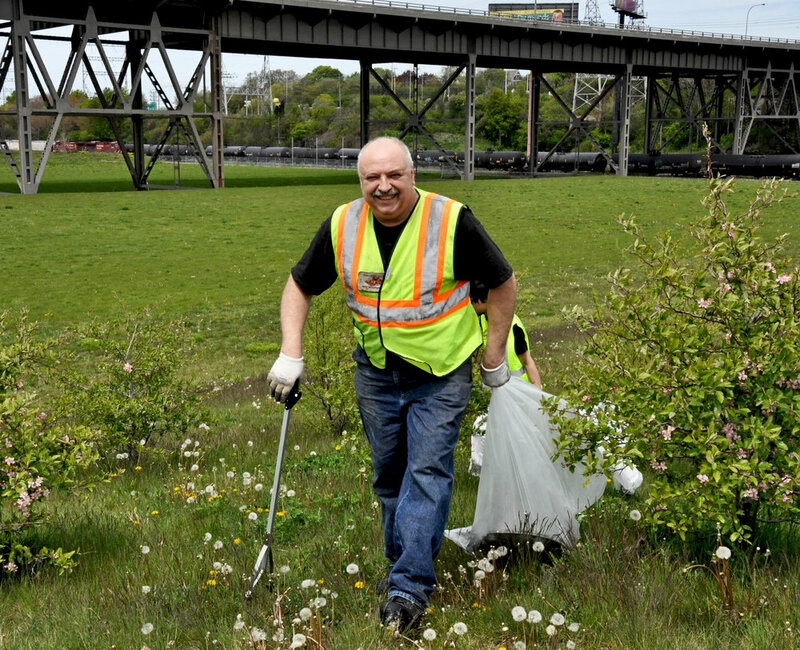 Thus, not only do businesses benefit from the park’s ability to prevent floods, but the park benefits from the litter removal that the Stew Crews provide. Part of the attraction to businesses locating in Menomonee Valley has been the use of shared stormwater management infrastructure. These businesses have saved money by leveraging a shared stormwater “treatment train,” so owners don’t have to buy as much land and otherwise implement these site features themselves. The park was really put to its first test in 2008, when the first 100 year rain event occurred since the implementation of the plan. It performed beautifully, not allowing any of the stormwater to enter the sewer system. This has encouraged businesses to invest in this property, with the last of eleven being slated to move in within the next year. Menomonee Valley Partners continues to do amazing work in this district and is now focusing on plans to develop more than 40 acres of riverfront land in the valley. Some of these remaining sites have no road access or utilities, presenting another challenging project for MVP. However, already a plan for a Riverwalk that acts as a vegetative buffer in this area will hopefully be approved by January. See the renderings below! For more details about recent economic development and future plans for the Menomonee River Valley, check out this recent article in the Shepherd Express. MVP has established a fantastic model that holds much potential for a “triple bottom line” benefits--economic, environmental and social--in other southeastern Wisconsin communities. Sweet Water looks forward to sharing information and connecting partners to help more projects like this take root for the benefit of our shared water resources. Newer PostSafe roads and healthy waters are incompatible? S(NO)w Way!